The price of European currency continues to decline. Yesterday the price has reached the lows of 1.3575, which seems to be the key level. At the moment the pair is traded at the level of1.3600. If the level of 1.3575 is broken down, the decline in the price will continue. The decline in Euro was caused by weak EU macro-economic statistics. It became know that growth in money supply in European countries amounted to 0.8%, which indicates low level oflending of economy by the banks and is probably the sign of deflation. Due to the lack of capital flow, economic recovery from the crisis has slowed down, which has a negative impact on salaries and aggregate demand. According to analysts, next week ECB may adopt measures to encourage lending. Probably the program of issuing unlimited loans to European banks will be extended (LTRO). Therefore, the meeting of ECB, which will be held next week will be important not only for EU economy, but also for speculators, who are ready to continue their attacks aimed at crashing European currency. The nearest resistance level is 1.3684 – the upper limit of the trading channel. 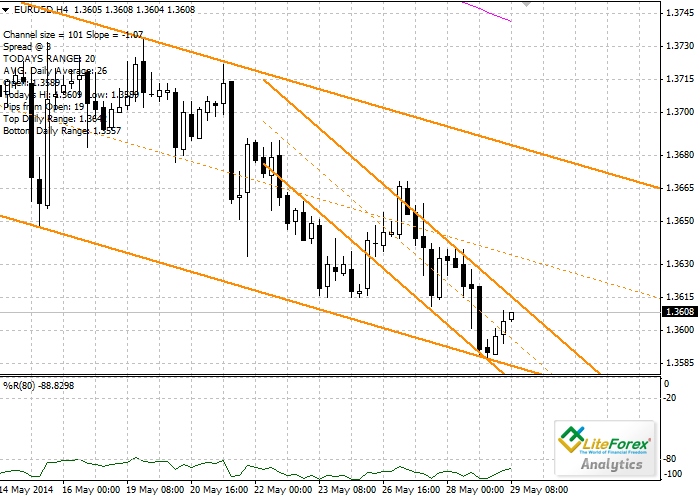 Support level is 1.3575 – bottom limit of the trading channel. It is recommended to open short positions after breakdown of the level of 1.3575 with protective orders at 1.3600 and the target of 1.3500.